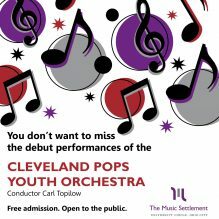 The Cleveland Pops Youth Orchestra under the direction of Carl Topilow will be presenting their debut concert on Monday, December 10, 2018, at Kulas Auditorium in John Carroll University! The concert begins at 7PM. They will also perform at Market Hall in the Van Aken District on Monday, December 17, 2018. The concert begins at 7PM. We are very excited about the debut performances of this exciting ensemble of young, talented artists and hope you all will attend! View the flyer with event details (PDF).